What a glorious Saturday morning! Spring is here, my pups are keeping me company as I type, sleeping on fresh sheets was amazing, I found some great tunes to play from hollylynn's blog while I'm blogging (thanks for that sweet dose of indoor sunshine, hollylynn! ), and my day is totally open to whatever comes naturally. Including getting a surprise visit from The Little Guy for the day! Now I must list seven things that I love, then pass this award on to seven bloggers that bring me tons of joy! 1. I love my family...so much. I get so much enjoyment out of spending time with them! 2. I love green tea and coffee...but not mixed together, of course. 3. 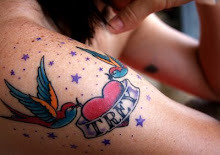 I love, and I mean absolutely LOVE, blogging! Reading, writing, observing your lives and thoughts... it's heavenly! 4. I love making things, even though I have recently learned I need a significant amount of training in the quilting department...so much for thinking I'm good at it! 5. I love spending time with my good friends. I had an amazing dose of quality friendship time last night, and I was w/o camera...that sucked but not enough to ruin the night. 6. I love being outdoors when the weather is warm, sunny, breezy.... it doesn't get any better than that! 7. I love the love that my dogs send my way... total adoration and sweetness. I have many more blessings in my life but I'll spare you the continuation of mushiness. For now. 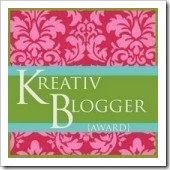 I would like to pass this Kreative Blogger Award to... The Rambler, Fabulously Frugalicious, If I Were Really Skinny, Simple Beans, Lyndsay, Philigry and Saskia. I could go on and on! I hope you have a wonderful Springy weekend!! !